Textures, patterns and backgrounds are some of the most useful elements designers can work with. From brand work, to print design, to simply giving your creations an authentic edge, they’re invaluable. Photographing and scanning your own textures, or meticulously hand-crafting patterns can take some serious time and effort. That’s why today’s bundle is the ultimate time-saver for any designer, bringing you literally thousands of ready-to-use items, right out of the box. 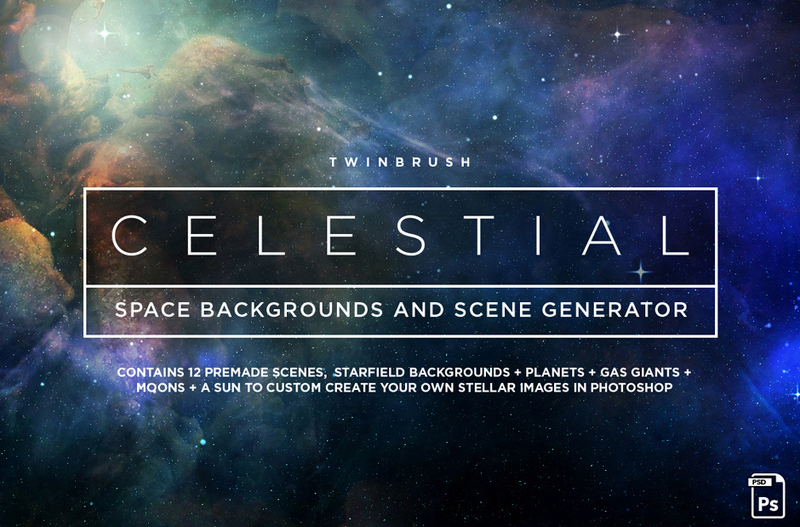 There is so much diversity in this bundle that you’ll be covered for any project that comes your way. 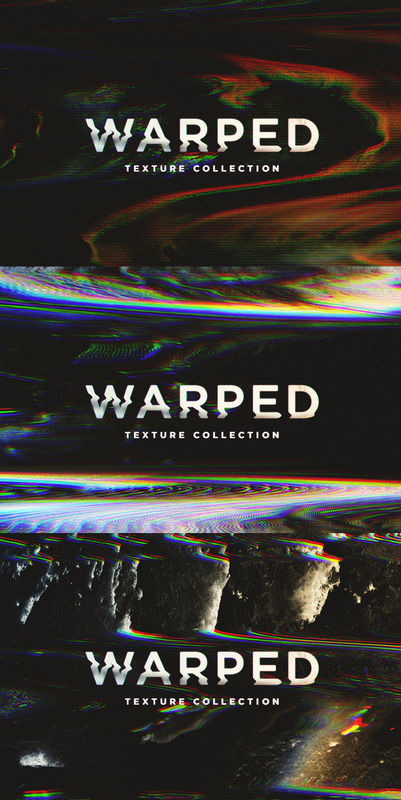 Inside you can discover a vast collection of gorgeous surfaces and patterns including: foil, paper, space, bokeh, light effects, fire, grunge, wood, marble, abstract, hand-painted, vintage, gold, glitter, pastels, floral, crayons, geometric, and more! We’ve also branched out into providing some never-before-seen styles for the DC community, including some slick modern backgrounds and cleaner designs. This is a truly comprehensive collection that you can delve into whenever you need an interesting or useful image to complete a piece. We’ve teamed up with some of the greatest names in the design industry to bring you their very best products. From the delicate, beautiful textures of Kim Klassen (a big community request!) to the popular foil work of Zeppelin Graphics, or gorgeous marble effects of Rule By Art, this bundle is chock-full of creative talent. The textures and backgrounds are gorgeously detailed and high-res. The patterns are totally seamless and ready to be dropped into your projects. More than being simply functional, these items are made for visual impact. They have been created specifically to add that extra touch to your work, elevating it to a whole new level. The textures can be used in any type of project! You can use them online for websites, blogs or banners or use them in prints and make awesome posters or stationery designs. You can also create your company logo and then spice it up with one of the gold foil textures from this bundle and we guarantee it will attract a lot of attention! And since the textures are all included in .JPG format, you can import and use these in any software you want or on any website you like! With 202 Shiny backgrounds in 8 distinct styles to choose from, you can enjoy fantastic creative freedom. Apply a broad palette of lights, sparks and illumination in your own unique designs. Every single background has been hand-painted with a stylus on a tablet, as a piece of art on its own. That’s why each one of them feels not like a computer generated image, but like an artistic creation with natural compositions, dynamics and details. Creatively apply light, sparks and glows to mesmerizing splash screens and add fascinating refined details. Your shine-enhanced designs will capture your user’s attention and blazingly increase engagement. With this collection of backgrounds, your designs used on banners and billboards will become the brightest of city lights. Make your vivid, luminous designs capture the eye in busy streets, rushing subways and everywhere outdoors, and indoors too! Design breath-taking sliders and intros full of light and space. Flare up details and accents. Craft glorious websites that are dull of dynamic action. The Collection looks gorgeous in both screen and print designs. Give your clients and end users the feeling of touching the light in stationery, business cards, flyers and everything else print. Unlimited potential to take your work to the next level. Don’t get stuck with background images that are poor quality, restrictive in use and downright amateurish. Our professionally designed, high resolution background images are the perfect solution for any project. The rich colors and crisp black and white images are so eye-catching! With so many to choose from, you’re sure to find the perfect touch for whatever you’re working on! Choose from over 63 backgrounds in 8 different categories for your websites, blogs, marketing promotions, print collateral and more! This product contains 10 fully editable Photoshop template files. Easily edit each gradient layer style to create your own look and feel. This pack also includes 20 transparent .PNG textures ready to drop into the .PSD file to create more options. Software compatibility: Adobe Photoshop CS5 and newer. .PNG files will work with most graphic software. 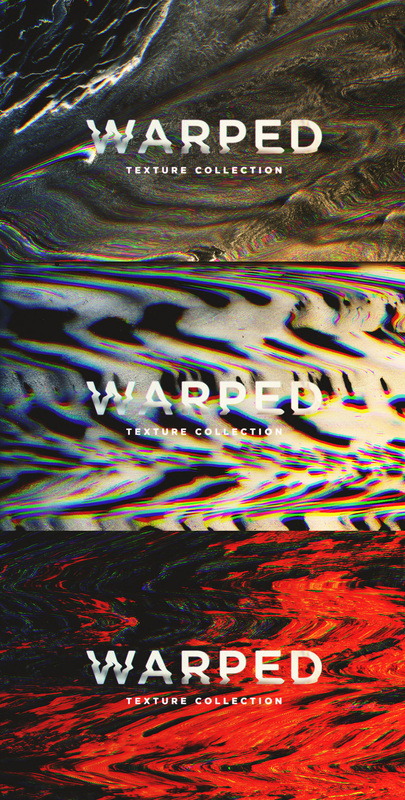 One of my favorite abstract texture collections yet. This set contains 15 extremely high-resolution files. Each massive file weighs in at 7000×10000 px, 300 ppi giving you a lot of flexibility with this collection. This pack explores digital feedback, and visual distortion. 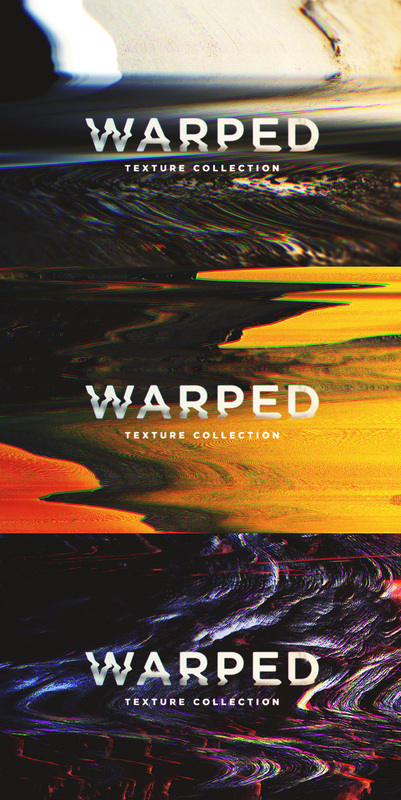 These versatile textures are great for music related projects, packaging, textile design, posters and typography. A massive collection of hand painted mixed-media, including grungy textures, paint, plaster, fibre and ink. Enjoy spattered, stamped, layered and scraped textures that will help you to create unique one of kind fine art designs. This collection contains 70 high res (3600 x 3600px), hand-made textures. A blend of paper, cloth, paint, pastels and inks, made from soft, subtle and heavy grunge. This unique mixed media collection is perfect for layering up. 50 high-res texture files in total – 38 unique textures plus 5 variations and 7 soft and subtle overlays. The Cloth and Paper Collection includes 36 high-res textures 4200 x 4200 px, plus a fun and fab set of 7 high-res overlay brushes, and a cloth and paper accent brush set. These textures were made from an assortment of antique paper, linens and cloth scans, mixed with a little paint, ink, chalk and of course some photoshop magic and… Voila. This set of 40 vintage paper textures is so versatile. 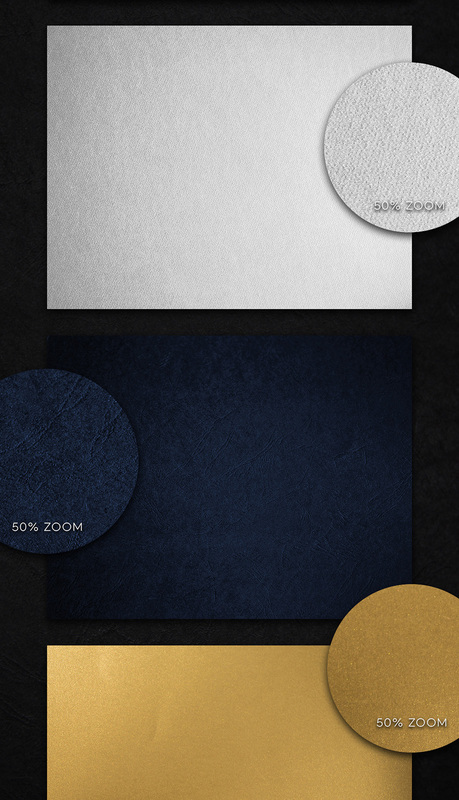 Each paper texture is a .JPG sized at 12″ x 12″ at 300 ppi, and were created by blending multiple layers. They make beautiful photo overlays, and can also be used as background images for your designs. The Heavenward Collection features vintage papers of all sorts layered together over digital paintings of clouds, sky, sunsets and sunrises. Absolutely stunning pastels and brights washed together to create unique textures for your project. 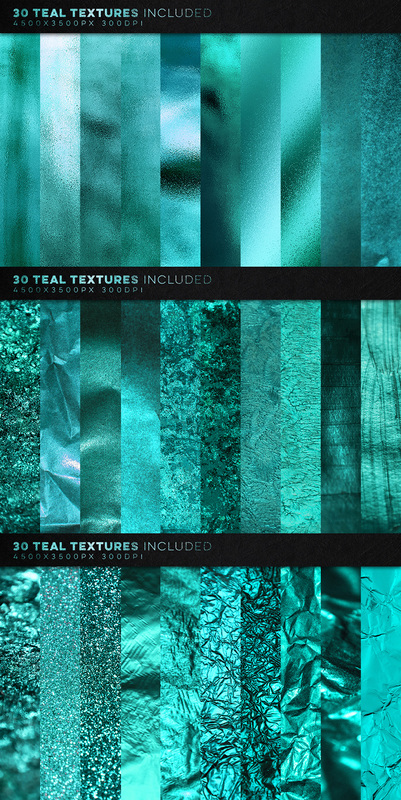 This set of 40 painted paper textures is so versatile. Each paper texture is a .JPG sized at 10″ x 10″ at 300 ppi, and were created using a digital painting technique. They make beautiful photo overlays, and can also be used as background images for your designs. The Agate Collection features softly blended textures that are reminiscent of agate, marble, other precious stones and even shimmering water reflections. Absolutely stunning pastels and brights washed together to create unique textures for your project. The Storm Collection features softly blended textures that are reminiscent of clouds, agate, marble, other precious stones and even shimmering water reflections. Absolutely stunning darks and brights washed together to create unique textures for your project. 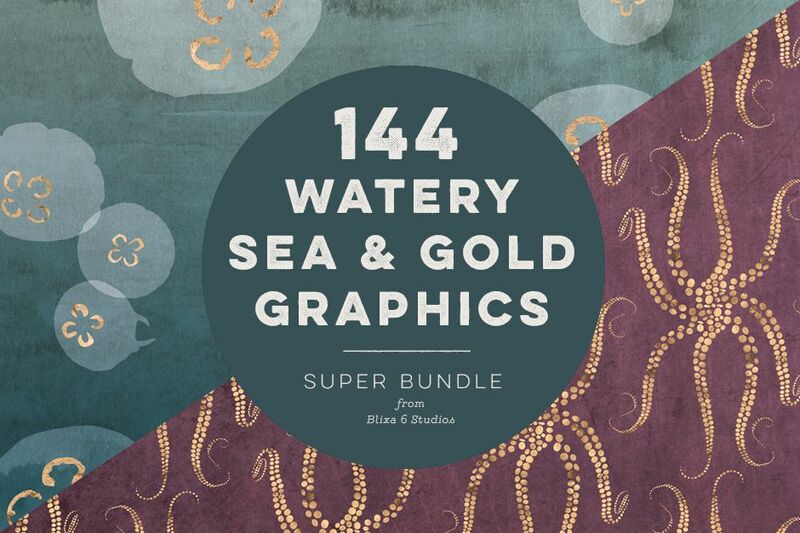 Dive into mystery with this exclusive selection of 144 rose gold graphics and textures, evoking a watery world of delicate sea creatures and explorer’s maps. Inside you’ll discover a bounty of 3600×3600 high-res graphics and textures including metallic golds and silvers, moody watercolors, supple fabrics, weathered woods and metals in rich atmospheric hues. For this unique selection made just for Design Cuts, I have curated a selection of my very latest textured patterns and digital backgrounds and packed them into one delicious set, bursting with coordinating colors, patterns and textures – perfect for building out your library of collage materials. Dive in and lose yourself in these brand new worlds from Blixa 6 Studios. Like a breath of fresh air and spring time flair, these watercolor textured dot patterns will bring a cheerful tone to your next project. In addition to a selection of richly textured watercolor graphics, you’ll get a handful of coordinating rosy golden egg dot patterns to inject a little luxe into your designs, in cheerful washes of color including coral pink, mint green, pale gray, deep purple, indigo blue, kale green and sunny gold. This set includes 36 high res digital graphics weighing in at 3600×3600 px and 300ppi, suitable for print or web purposes! Give your next project a hint of shimmery silver seduction with this cool selection of raw organic graphics and textures that evoke the spirit of the frozen north. You’ll get an intoxicating collection of delicate silver foil marbled patterns, shimmery metallic textures, rich velvets and watercolor textures in atmospheric iridescent pink, aqua blue, jade green, deep purple, shimmery neutral and petrol hues. Great for your next design or craft project, you can use these high-resolution digital papers to make your own shimmery cards, gift tags, wrapping paper, canvas bags, t-shirts, scrap book collages, wedding party invites and more. Mix and match the patterns to create your very own custom look. Dive into the depths of the deepest seas with this rich collection of rose gold encrusted patterns and textures. From mosaic octopus to translucent jellyfish, ragged waves and weathered textures in coordinating hues of petrol, russet, kale, aubergine, taupe, olive and mauve, you’ll have all the details at your fingertips to create sophisticated works with a richly textured nautical theme. 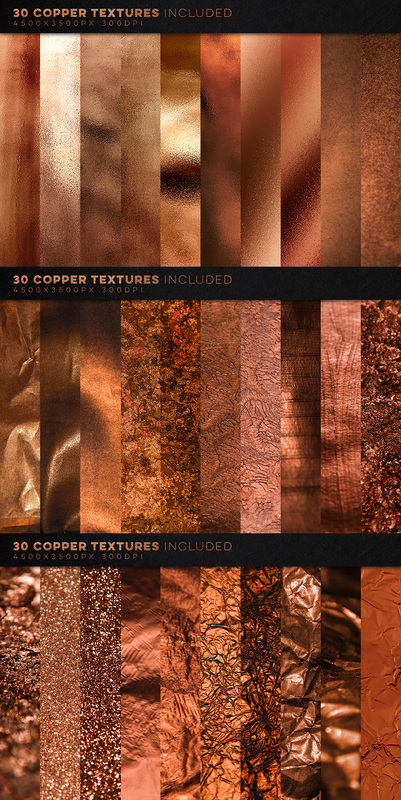 Give your next project a hint of watery rose gold mystery with this deep selection of organic graphics and textures that evoke stories of sea creatures and the high seas. You’ll get an intoxicating collection of delicate golden foil octopus, jellyfish, waves and marble patterns, shimmery mother of pearl and natural metals and atmospheric maps and ancient wall paintings in aqua blues, mint green, rose quartz, shimmery neutral and petrol hues. This new set comes with 20 high-resolution Daguerreotype Textures and 5 Photoshop Actions to help you achieve that truly original Daguerreotype look. Save hours of work and research and create your own Daguerreotype Photo in just a few steps! You can use these high-quality digital paper designs for scrapbooking, wedding and party invitations, birthday cards, photo albums, baby shower cards, banners, business cards and stationery, tags, labels, stickers, websites, blogs. • Images measure 12 x 12 inches (30.5 x 30.5 cm) and have 300 ppi resolution for the best quality printing. 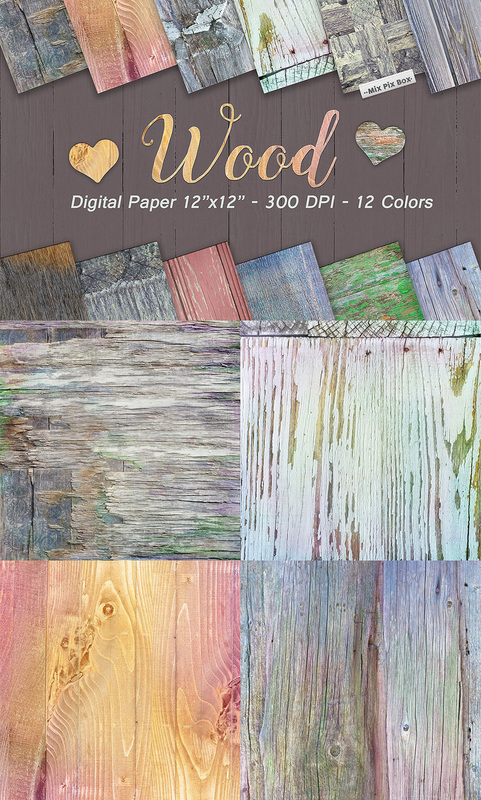 Gorgeous, high-resolution wooden textures that can be used for digital paper designs such as scrapbooking, wedding and party invitations, birthday cards, photo albums, baby shower cards, banners, business cards and stationery, tags, labels, stickers, websites, blogs. 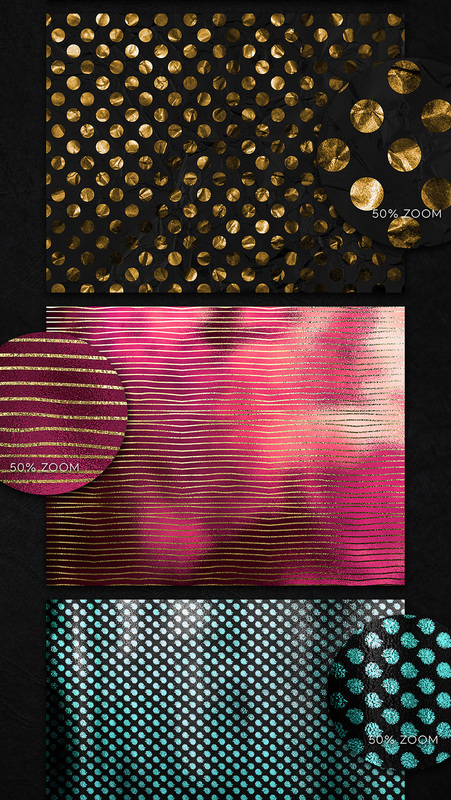 Offering a simple and quick way to add some sparkle to your creative work, this chic pack offers a selection glitter and sequin patterns, textures and colour blurs. Great for use on packaging, cards, invitations or simply decorating up a special quote, the patterns offer a super simple way of filling an area, or you can simply head straight for the wallpapers or colour blurs for an instant glitter blast! I’ve also included additional greyscale versions of everything so you can easily create any custom colour. Simply set up an overlay layer in software such as Photoshop or Illustrator for any colour combinations you might need. • .JPG, Photoshop library file and Illustrator .AI (embedded images*) files. *I’ve included the pattern swatches in an Illustrator .AI file for your ease of use. I don’t want to imply that these are editable with all the benefits of traditional vector files. They are simply the .JPG patterns saved as swatches within Illustrator, with which you can easily fill any size area you wish. Software compatibility: Adobe Illustrator CS1 and newer. .JPG files will work with most graphic software. This is a collection of 33 modern and unique textures/backgrounds. All paintings are carefully created by hand, scanned at high resolution and then digitally manipulated. You can use them for decorative paper, invitations backgrounds, scrapbooking elements, postcards, notebooks, business cards and many more. • 33 original paintings, .JPG (RGB colorspace, 300 ppi, see all dimensions on the first preview). 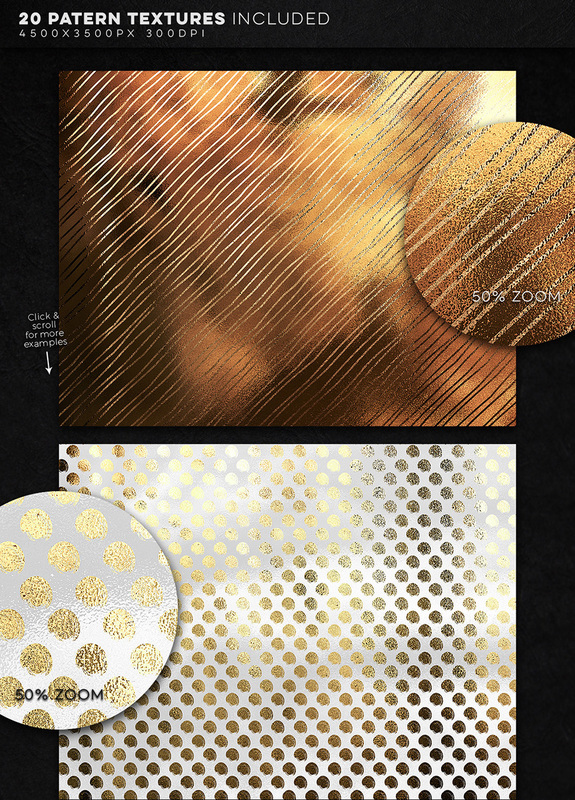 Introducing Gold Veins, the collection of seamless marbles background with light gold veins. 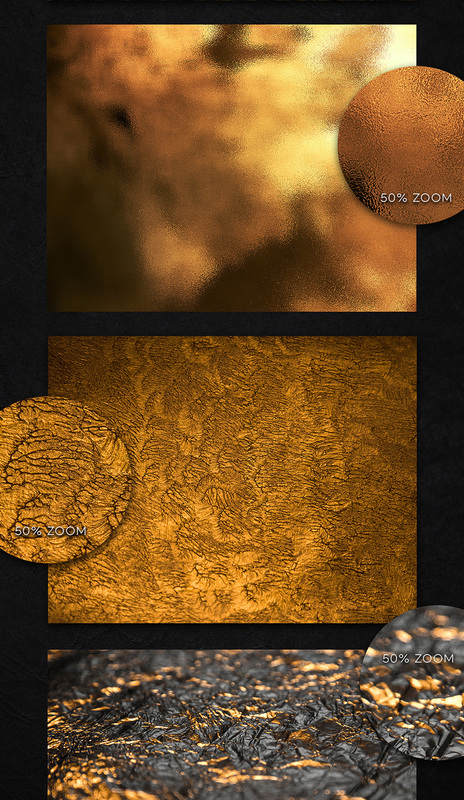 Use these backgrounds to enhance your designs and create unique marbled items! • 15 seamless marble and gold papers in high quality 300 ppi, each saved as a .JPG file, 12″x12″. Get ready for spring with Bloom, my collection of seamless floral patterns made of unique hand-drawn elements combined with beautiful shades of fresh pastel colors. You can easily change the colors and create endless possibilities to enhance your designs from wedding invites to packaging projects. The vector illustrations allow you to make your own compositions out of this set! Software compatibility: Adobe Illustrator CS2 and newer. .EPS files will work with a variety of programs such as Adobe Photoshop or Illustrator, Sketch, InkScape, Affinity, Corel Draw, etc. .JPG files will work with most graphic software. “My Crayons Box” includes everything you need to create awesome designs! From seamless patterns to a vector alphabet and handmade strokes, get inspired and make your own collection of hand-drawn patterns to turn them into unique products. All the patterns are 100% seamless with a colorful palette as seen in the preview images. You can easily scale down, up, rotate, move and change the colors of any of the elements to match your needs. They are especially appropriate for any kid-related materials. Software compatibility: Adobe Illustrator CS2 and newer. .EPS files will work with a variety of programs such as Adobe Photoshop or Illustrator, Sketch, InkScape, Affinity, Corel Draw, etc. .JPG and .PNG files will work with most graphic software. A set of 12 patterns inspired from traditional Indian textiles. 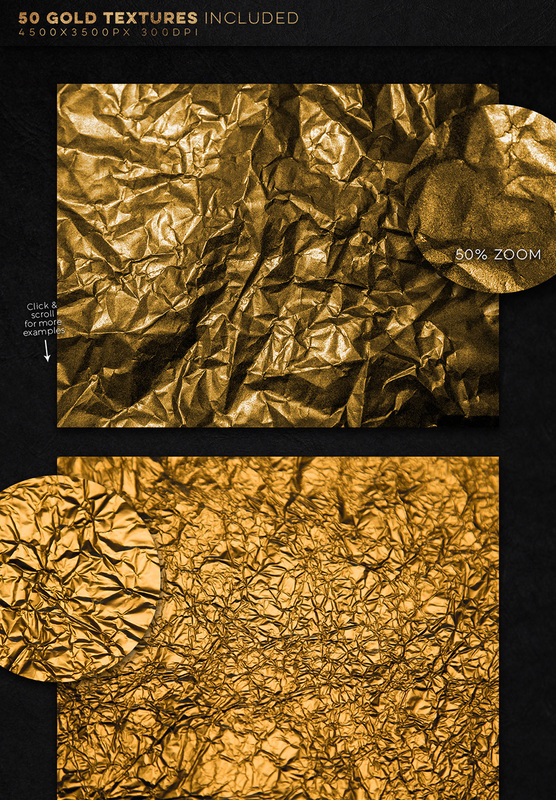 • Bonus: .JPG high resolution digital papers with texture (3600 x 3600 px). The textured version does not come in vector format. Software compatibility: .EPS files will work with a variety of programs such as Adobe Photoshop or Illustrator, Sketch, InkScape, Affinity, Corel Draw, etc. .JPG files will work with most graphic software. 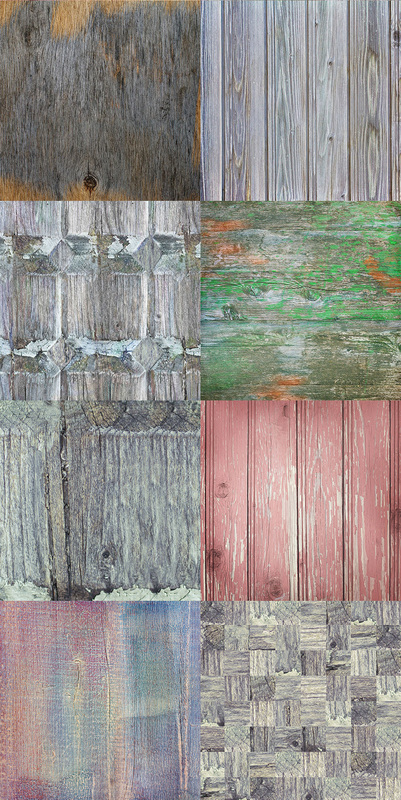 A new wonderful set of vintage paper textures has just arrived! At 11x14in this collection will be perfect for your larger format projects and will give you more freedom when working with small sizes. 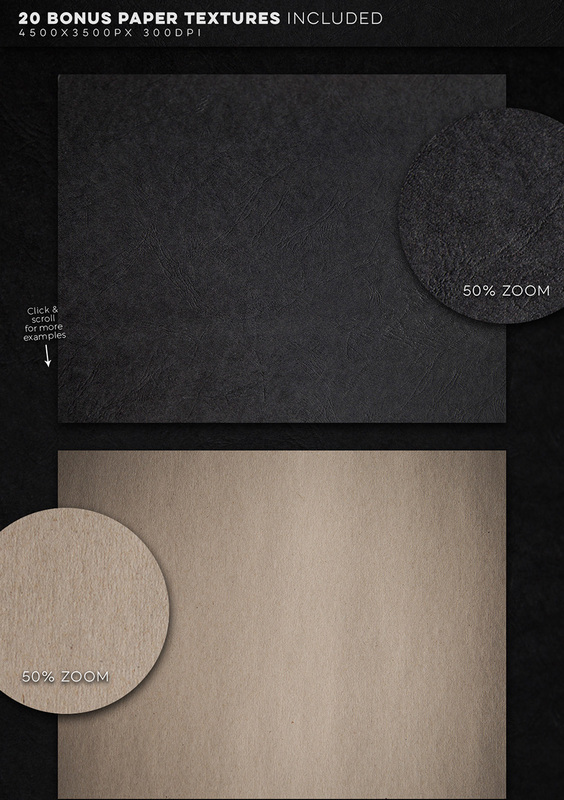 The pack includes 30 natural paper textures ranging from off-white to burnt brown. Scanned from real antique books and gently retouched in Photoshop to bring out the subtle grain texture of each piece. 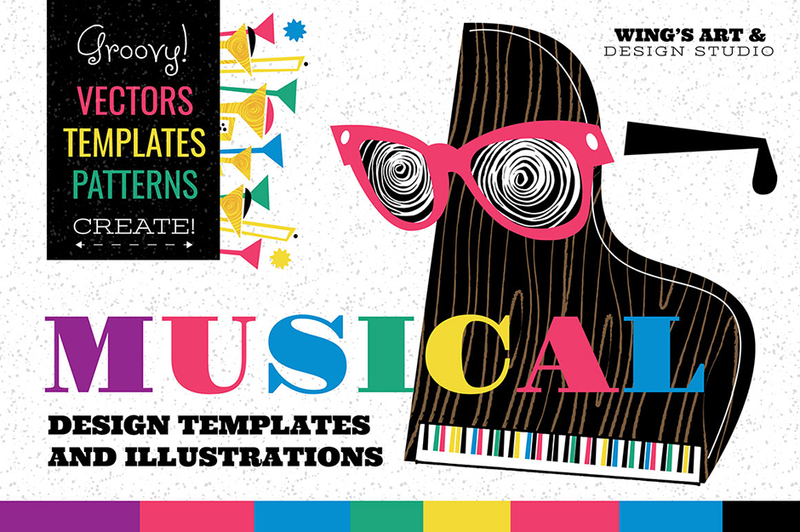 Perfect for invitations, mockups, art prints, overlays and more! Meet Pattern Punch – vector patterns so dynamic and full of personality, you’d almost say they are alive! Pattern Punch is a set of 50 patterns for Adobe Illustrator inspired by mid-century home textiles and the love for playful spontaneous art. All pattern elements were hand drawn on paper using ink and acrylic paint, then vectorized in Adobe Illustrator and arranged into quirky seamless repeats. Guaranteed to bring a fun and happy vibe, and hand made imperfection to your next creative project! And let’s not forget the handy bonuses: 10 color palettes to help you bring a retro mood to your creations and 5 hand drawn vector illustrations for instant pattern pleasure. The patterns are perfect for apparel, accessories, brand design, wall art, greeting cards, invites, nursery art and more! 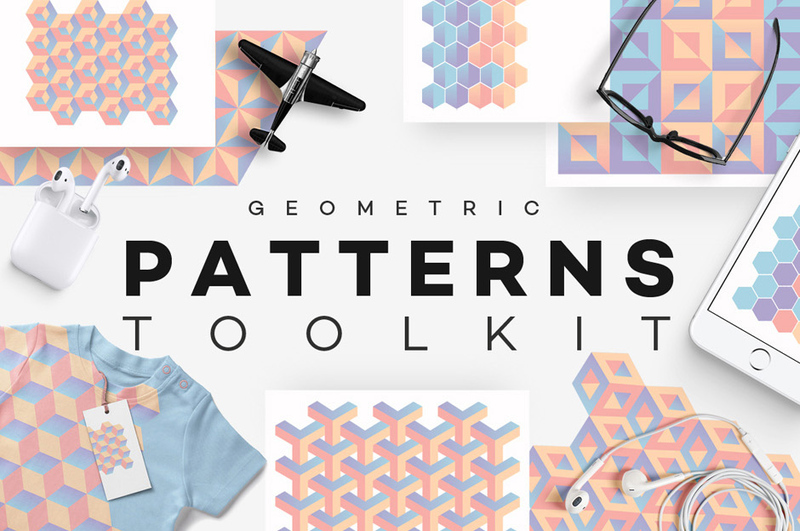 A collection of simple geometric patterns in light, feminine colors. The seamless digital papers and repeating web tiles are perfect for use in your scrapbooking and craft projects or as backgrounds for your blog or website. A collection of 20 colorful handcrafted seamless patterns. You can use them for your print designs, on textiles, or for your website’s background or graphics. You can recolor the patterns in Adobe Illustrator using the recolor artwork tool. Software compatibility: Adobe Illustrator CS5 and newer. .EPS files will work with a variety of programs such as Adobe Photoshop or Illustrator, Sketch, InkScape, Affinity, Corel Draw, etc. .JPG files will work with most graphic software. Pack of 30 unique seamless vector patterns with great customization possibilities. You can use it in so many ways: backgrounds, web-design, advertising, t-shirt design, all types of prints! • Easy customization in the Adobe Illustrator: stroke color and thickness, fill colors, transformations. • Different files formats included. Pack contains more than 210 files! • You can use it in so many ways: backgrounds, web-design, advertising, t-shirt design, all types of prints. • Vector seamless customizable files: 30 .AI files, 30 .EPS files, 30 .PDF files. Software compatibility: Adobe Illustrator CS6 and newer. .JPG and .PNG files will work with most graphic software. 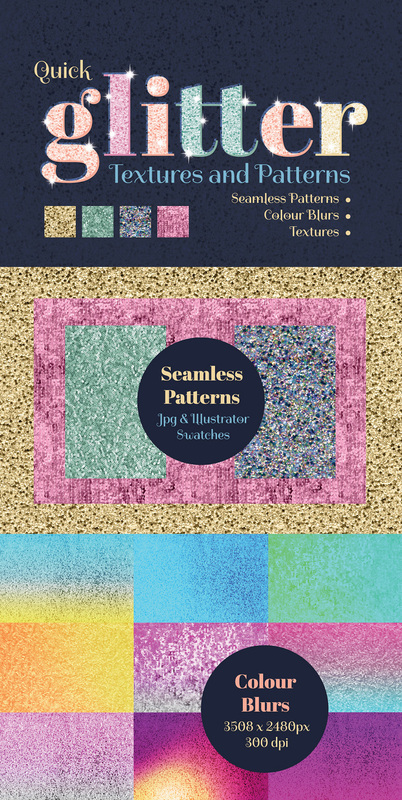 I am so happy to introduce you to “Limitless Dots” a colourful pattern pack, hand painted and carefully edited to make your creative process easier! The pack includes 25 watercolour patterns at a high resolution with transparent backgrounds. The patterns are great for all kinds of design projects like branding, packaging, greeting cards, clothes & fabric print, scrapbooking and even wedding invitations or any decorative project. Software compatibility: Adobe Photoshop CS3 and newer. .PNG files will work with most graphic software. Get beautiful seamless patterns with the Darling Days Pattern pack. The Darling Days pattern set is a playfully fun floral collection inspired by sunshine and bright colors. • 10 Coordinating Darling Days Patterns, plus 2 bonus colorways which gives you 12 total patterns! Software compatibility: Adobe Illustrator CS3 and newer. .EPS files will work with a variety of programs such as Adobe Photoshop or Illustrator, Sketch, InkScape, Affinity, Corel Draw, etc. .PNG files will work with most graphic software. Introducing “The Bold Minimalist Collection”- a modern and crisp set of vector patterns, hand drawn to give a unique look. These are awesome for your branding, packaging, fabrics, phone cases, and more! Software compatibility: Adobe Illustrator CS5 and newer. Introducing this new elegant set of 40 Circular seamless vector patterns. Simple line geometric patterns that look sophisticated and balanced! They can give your designs a modern look and yet they are simple enough to offer you so many creative play options. Also note the .PAT file is included with all patterns to use in Photoshop too! They can be ideal as backgrounds for branding projects, packaging, stationery, social media, web design, fashion apparel, posters, leaflets or just try them as layers over your photos with great results! Software compatibility: Adobe Illustrator and Photoshop CS4 and newer. .EPS files will work with a variety of programs such as Adobe Photoshop or Illustrator, Sketch, InkScape, Affinity, Corel Draw, etc. .JPG and .PNG files will work with most graphic software. Introducing this new beautiful set of 40 Feminine Elegant seamless vector patterns. Simple line patterns with a touch of elegance! They can give your designs a sophisticated look and yet they are simple enough to offer you so many creative play options. Also for the first time the .PAT file is included with all patterns to use in Photoshop. They can be ideal as backgrounds for branding projects, packaging, fashion apparel, posters, leaflets or just try them as layers over your photos with great results! Introducing this new set of 10 Map-like seamless vector patterns. Tileable vectors that look like city maps (please note no particular cities are depicted) to give your designs a lovely wanderlust feel! They can be ideal as backgrounds for branding projects, packaging, fashion apparel, posters, leaflets or just try them as layers over your photos with great results (see preview shots for more inspiration)! 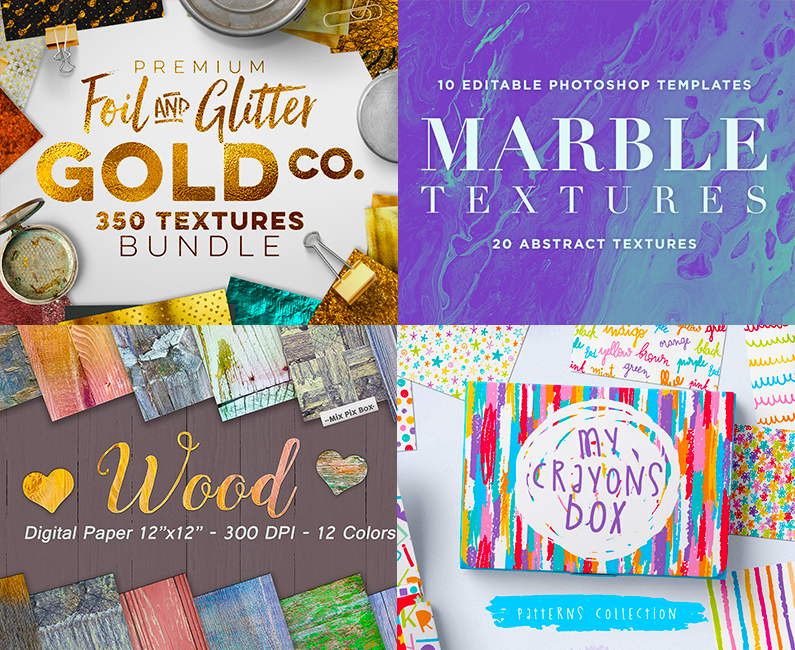 This bundle offers tons of gorgeous, versatile textures, patterns and backgrounds - perfect for taking your creative work to the next level! We've included a vast selection of designs, ranging from artistic and grungy, to clean and modern. The resources are organised into carefully labelled folders, and a .PDF guide and image gallery are included to make browsing and downloading them easier for you. File size is approx 14.3GB (17.57GB unzipped), split into 28 parts or an optional one click download. A .PDF guide and image gallery, have also been provided for easy browsing. I am so happy with the items in this pack. The variety is fantastic and the vector and image quality are superb. i regret that I didn’t buy this deal and hope you will offer it again sometime. Thank you so much for your comment and I am really sorry that you didn’t manage to pick this one up. Unfortunately, as we now have our marketplace, we will no longer be featuring our older bundles as re-runs in conjunction with our new bundles. I’m so sorry to disappoint you! I’m glad it was possible to buy this bundle after deal expired, thank you for that. However I found lack in in The Paper Town’s files. In the Seamless Hand-drawn Crayons Patterns set, in vector file, there is no vectors, just empty art board when you open it. Thanks for the comment and you are more than welcome for the help with the bundle- you luckily managed to knab it just as it had expired :). Hmm that doesnt sound right about your Paper Town files- I have checked them on my side and I can see the products so it may be that there was an interruption with your initial download- rest assured I have sent you over a link to the file which should help! With the naming of our files Zuzanna, we name them by the designer who has created them as often we will have a designer provide 2-3 items per bundle and this would cause for a very lengthy download list if we were to name them by product. To make things easier for you to locate what you’re after, you can use your PDF guide and Image gallery which will help show you the designer you are after and then you just need to download their files :). Great pack—very versatile. I’m wondering if you have any plans to offer video/animated backgrounds such as these? If so, I’d buy it in a heartbeat. I’ve got a huge collection of static backgrounds so my biggest need right now is to create a library of video backgrounds. Have you considered offering any video/animation-based packs? This is a great idea so I’ve popped your suggestion over to our Product Curator- Lizzy as well as sending you an email, as i’d love to get some examples from you on this! give me email “about App usage details” specific terms license..
your terms about Textures under.. that “original design” include app making??? Thank you so much for your comment and my apologies for any confusion caused with our license! can i use texture jpg for android app making?? I don’t know how you guys do it! I thought I had everything I could ever want from you (and I do) – but you make your products it look so enticing, and I always check that I don’t have any items already – and I never do!!!! I don’t want to encourage you to continue on being so fabulous and I can’t fit much more on my hard drives. Thanks for naming the files logically: when I’m looking for a gold background there is no problem when I search for ‘gold’. Thank you so much for the awesome comment! It’s fantastic to hear that your always able to pick something new up from Design Cuts and we super appreciate all your ongoing support- I cannot tell you how much it means to the whole team and I.
I am Japanese Comic Artist.Sorry I Can not speak English. This design is very good and very low price…Thank you. I don’t found Terms of service in this service. I tried to ignore this bundle. I really did…. designcut is my favo, i look all week for bundle deals and buy it! i dont why i love the bundle price. Thank you so much for the awesome comment, your support is super appreciated by us all! The pattern bandit strikes again! Can’t wait to find a good use for all of these amazing goods! Thank you! Thanks so much! It’s great to hear that these textures and patterns will make a useful addition to your creative toolkit 🙂 We hope you enjoy working with them! I am with the ones who salivated over this deal! Thank you so much! I would like to watch tutorials on how to use these..when will it be posted? We’ll be posting the tutorial for this one on Thursday 23rd March 🙂 I hope this helps, and please don’t hesitate to contact me should you have any other questions. I’m here to help! Thank you so much for your incredibly kind words! I am new to this site, to tell you the truth i do not know how i got on the mailing list. new resource in y computer, one i can afford. Thanks again, Ronetta! If you ever have any queries or if there is ever anything I could assist you with please do get in touch. I’m always happy to help! I promised myself that I was just going to take a quick peek. I have so many of your wonderful deals already. Ooooh, fabulous textures, amazing backgrounds. Willpower=0 Mouse click=1. Need to stop opening your emails. Thanks again, Marianne, and if there is ever anything I could assist you with please do get in touch. I’m always happy to help! What an amazing selection of patterns, backgrounds and textures. However, I must behave. I still haven’t gone through and organized my previous pattern and texture bundle that I purchased a while back and I made a promise to myself that I need to go through that plus other resources I haven’t had time to catalogue before making any more purchases (as much as my trigger finger would like to do otherwise). Is there any easier way to download the whole bundle? like torrent or something similar? Thank you so much for your comment and for picking this one up! Have to have it…. could not resist. Excellent bundle of textures. Well done (again) Team DC. Aww thank you so much for your lovely comment and purchase! KIM KLASSEN!!! She is the Queen of Textures. 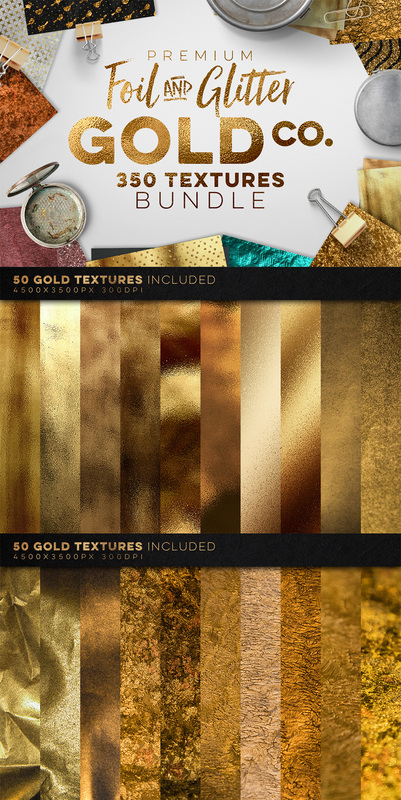 This deal is worth it for her textures alone. Thank you so much for the fantastic feedback. We are huge fans of Kim too and were super excited to share these with you 🙂 we are glad you like them! It is like Christmas every two weeks! Now I just need to find the time to do all the projects that spring to mind just looking at these textures. Thank you so much for your comment- Christmas every two weeks is awesome! 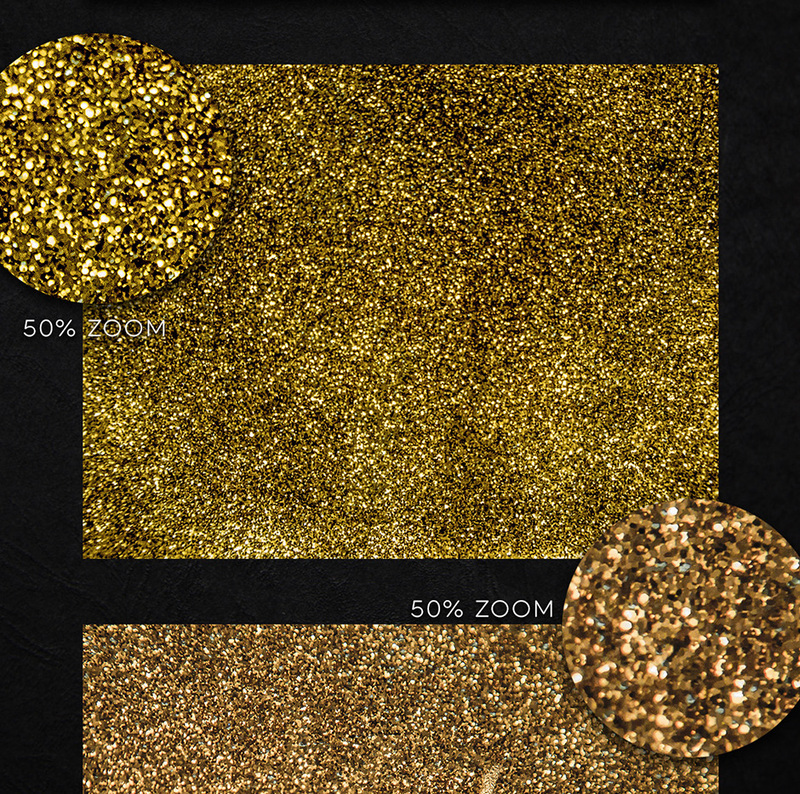 Those glitter backgrounds sealed the deal…great bundle!! Thank you so much- we are so glad you love them! OMG. I resisted the last deal until the last minute and today I see this. So many GORGEOUS, GORGEOUS textures and patterns. I won’t be able to resist! Thanks for the comment! That is great to hear you managed to grab our Mockup bundle and I am so sorry to be tempting you again with another delicious bundle! We are delighted though to hear you are loving the look of this one :). I am hoping that this is the mmmm’ing of contentment? :). We really hope you like this one and if you do have any questions, please do let me know! OMGSHH!!!!! THIS IS SOOOOO FREAKING GREAT!!!! You guys are awesome! Thanks for the amazing comment!! We are so pleased that you like this one and we think you and the rest of the community are pretty awesome too :). Holy crap batman! 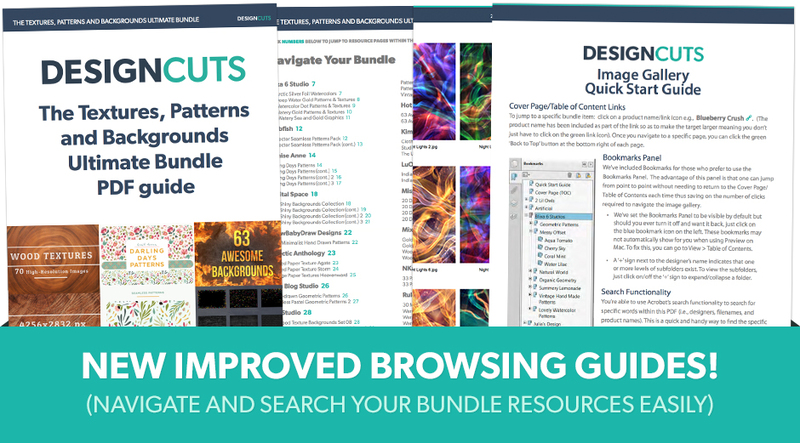 Includes Our New and Improved Bundle Browsing Guides What the What!?? OMG so loving this. Really…totally…I can now make some new wallpaper for my cardboard box! Woot! KERPOW- this bundle has landed and I am delighted to hear it’ll work for your cardboard home lol! Your comment has made the whole team giggle Tammy! Okay I skip this bundle when i thought it will be similar with last month textures bundle… then what happened!! I saw it more and more awesomeee… Really can’t resist it!! I need this to complete my every-project! Thank you for always making day brightly, you guys really help alot!!! Thanks for the comment- that is wonderful to hear you couldn’t skip this one :). Your comment has definitely brightened our day in DC HQ Wenny and we really hope you get so much use out of them for your projects! Please do feel free to share anything you create as we would love to see what you are working on! Oh thank you so much for your incredible comment! We are so happy that you like it- we have been so excited to launch it so your feedback really means a lot to us! You are more than welcome and thank you so much for the comment and we are so happy to hear that you think this is an amazing one :). We really appreciate your support and your feedback and I hope you love working with it! You can never, ever,ever,ever have too many textures, backgrounds and patterns in your creative stash!! Instant purchase!! Looks great. We totally agree with you on this and we think there are some awesome toolbox elements in this one! you had me at the first product! awesome bundle, as always… thank you so much!! Thanks for the comment- I have been chatting to you earlier about this and it is something that we are working towards but in the meantime, hopefully the Dropbox link I sent you will help somewhat! This comment is everything lol! I hope the bundle gives you lots of inspiration for your real and pretend projects and we would love to see what you create for either :). OH MY GAWD!! KIM KLASSEN! She and Denise Love, 2 Lil Owls, are my FAVE texture designers ever!! About time Kim joins the happy band of artists and creatives in your super troupe! That is awesome to hear we featured one of your faves and we are delighted to be working with Kim Klassen :). She has been requested a lot by our community! Thank you for the amazing feedback and we hope you absolutely love working with this one! Definitely another 5-Star for this bundle. Keep it coming Team DC!! Congratulations!! I am so happy this one has made you dance again! That is fantabulous to hear :). Hmm dance names- The Ultimate Patterns and Textures Throw Down Boogie? We definitely have lots more to come this year and hopefully there will be lots more dancing! Uh Oh, sorry about that Kathleen! We think this one is pretty irresistible ourselves :). Oh My Gosh… This is UNREAL!!! How can you guys do this EVERY time ALL the time?! I want ALL of this!!! Can I move in and live with you? Just take all my money and feed me your awesome stuff! Thanks for the comment and the offer of a new roomie lol! We are actually blown away by your comment and how amazing it is, although im not sure how comfy DC would be for living in….. we do always have lots of tea and coffee though :). Have an awesome time creating with this one! Its that second Tuesday again, late afternoon approaches, the tension mounts, what will it be this time? We have a similar run down on every second Tuesday except on our side its usually ‘what time is it, can we go live yet and always, will our community like it? ?’ So this comment is top for reassuring us :). We hope you love your new bundle and please do feel free to share anything that you create as we would love to see what you are working on! Misprinted Type!!!! YAY!!!!!! This whole bundle = YAY!!! I also love the fonts made by Misprinted and Kim Klassen’s textures! Oh my…..have to get me a bigger external drive now. As always Louis & Caat, I will definitely let the Product Team know that you would love to see more from Misprinted Type in our Marketplace and they will do their best to get this secured. Thanks for the comment and the double YAY! We are so happy you are liking this one and hope you get loads of use out of your new toys :). This is exactly why I don’t follow you guys on I.G. Reason being my profile is public and all the looky lous wanting to know my secret sauce will surely find out my source if they check who I follow. Keep the goods coming. I’m hoarding and creating. This comment is amazing and it has made me chuckle today- you gotta keep those looky- lou’s at arms length lol! Rest assured, we’ve plenty more deals in the pipeline for you and thanks for the support :). Thank you so much for your comment and we are so pleased you like our latest bundle. I will definitely pass your kind words over to Lizzy, our Product Curator who put this one together :). Thanks so much for your awesome comment- we are so happy you like this!